Do you trust everything your eyes see? Don’t you think that the way you see things is not always the way they look like in reality? I started to ask this to myself after visiting the Anish Kapoor’s temporary exhibition at the Leeum, Samsung Museum of Art in Seoul. In fact some of the Kapoor’s artworks we saw that day play a lot with perception, making art open to interpretation (at least they did for myself). 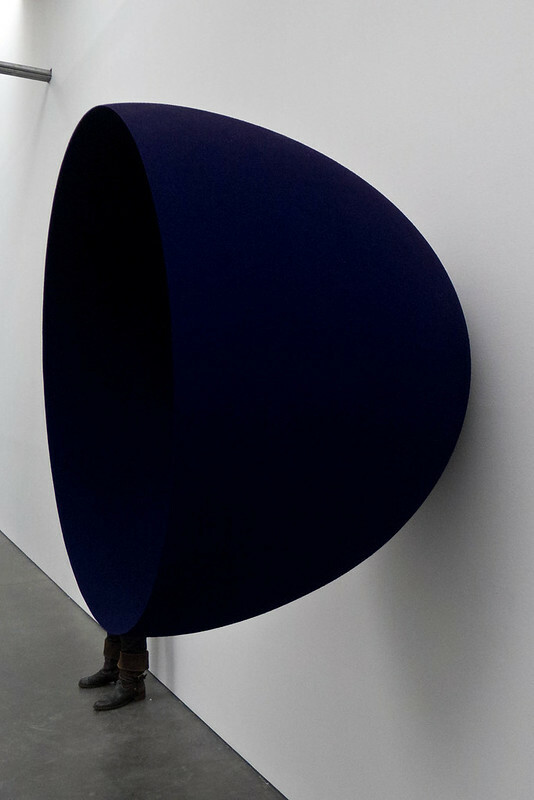 I always thought that Anish Kapoor’s art is very interesting, beautiful, seductive, elegant in a way and simply perfect in its shape, presentation and material. No, I haven’t been paid to write this, I truly love his works and I believe he is one of my favorite living artists that I have had the luck to discover and enjoy (I’m sure I’m not the only one). It all started when I saw ‘Ishi’s Light’ for the first time at the Tate Modern in London, then it grew even more at the MAXXI in Rome when I was standing in front of the ‘Widow’, an impressive Kapoor’s piece if not only for its dimensions. Seeing an entire exhibition dedicated to him at the Leeum Museum was simply awesome and I felt very lucky to be in Seoul at the right time considering that it apparently is Kapoor’s first major museum show in the whole of East Asia. For my happiness we were allowed to take pictures, yeah! The first thing you will see, and you cannot miss as you approach the museum, are the outdoor sculptures. In fact, in the garden there are three stainless steel pieces including the most recent ‘Tall Tree and the Eye’ of which I found myself playing in front of and watching my image distort in each of the spheres. Even if this is not my favorite piece, it certainly made an impression. I personally preferred the ‘Vertigo V & VII’ which not only reflected my image and everything around it, but it created a lot of copies of it showed one into each other, so odd, I loved it! When we entered the exhibition inside, at first I noticed a massive yellow square with a big orb punched inside the wall. This piece called ‘Yellow’ is definitely interesting to watch from different angles and makes you want to put your arm or head inside the concave of the wall to see if it’s real or if it’s just a trick of your eyes. There also are some of Kapoor’s earlier works, very brightly colored objects lying on the floor almost melting with it and making it look like their other half is underneath the ground hidden away. As I said most of Anish Kapoor’s works play with your senses, one of my favorites consists of three concave sculptures made of fiberglass and pigment that give you the illusion of been solid, only when you get closer and from a certain angle you can actually tell that they are empty dense dark blue shells. As we made our way upstairs to the second floor, we soon smelled something waxy, by turning our heads we saw this red sculpture that reminded me of a giant record player or of a messy cake. 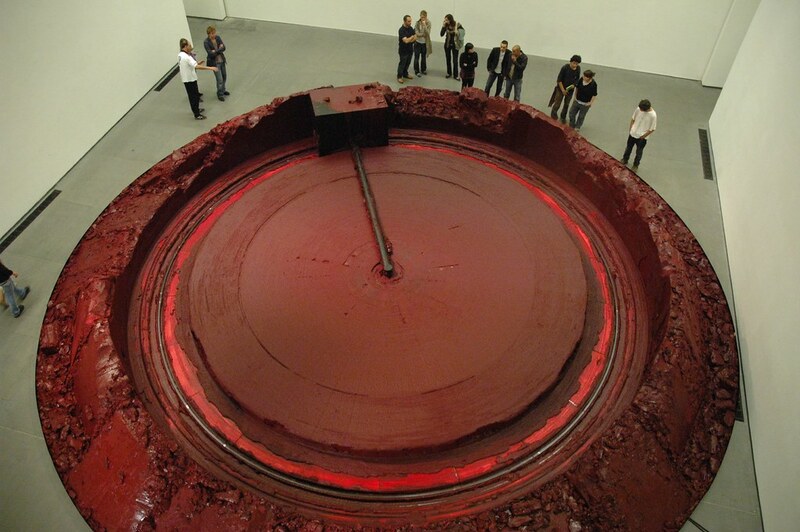 Called ‘My Red Homeland’, it consists of a massive hammer that makes one rotation per hour on a round ‘plate’ of red wax, remodeling it and continually changing the way the sculpture looks. Unfortunately the hammer wasn’t moving when we saw it, but it satisfied us all the same. The Leeum, Samsung Museum of Art is only 8 minutes walk by the Hangangjin Metro Station (Subway Line 6). Take the exit 1, walk straight for 100m towards Itaewon, at the first alley turn right to an hilly street, the Leeum is about 5 minutes from there (not far from the Hyatt Hotel). HIGH – The entrance is a bit expensive if you are on a budget, but it’s worth the splurge. The day pass is definitely a saving if you have the time to see also the permanent exhibition like we did. If you didn’t understand it yet from the tone of my article, I loved this exhibition and I strongly recommend it to anyone. It made me want to see more of his art and his architecture project. No need to be an art expert, everybody can enjoy Anish Kapoor’s works. This exhibition is still on until the 8th of February 2013, hurry up if you are in Seoul or anywhere nearby. Have you ever seen any of the Anish Kapoor art? How does it make you feel?